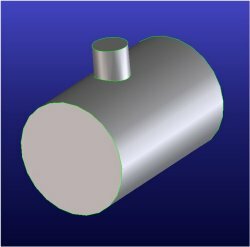 This page talks about Computer Aided Design (CAD) and demonstrates a free 3D software for download. 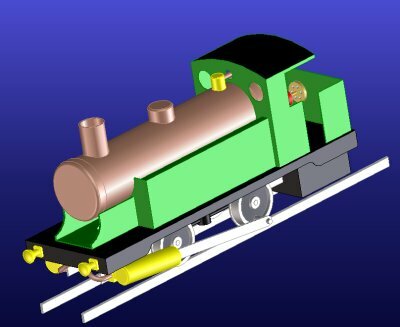 3D model of a simple steam locomotive. Early CAD software was a replacement for the manual drawing board. Parts were still constructed with lines and arcs, with some assistance given to make hatching and rendering quick and easy. These early software types had the advantage over manual drawing in that modifications were quick and easy, duplicate designs could be produced much quicker and drawings could be copied and distributed electronically. 2D software is still used by Architects who work in line drawings with orthogonal projections. They are also used for Wiring diagrams, sketching, pluming layouts and in PCB design. 2D drawings are needed to produce working drawings from which physical parts can be made. These drawings include dimensions, material specifications, tolerance information, revision control, author/date details and any special notes about the part. However 2D drawings are now, more typically, produced automatically from 3D models rather than being drawn line by line. 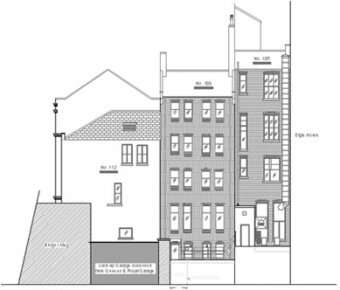 Producing drawings automatically is very time efficient especially when illustrating cross-sectional views, isometric views and detailed cut-aways. These are very time consuming if drawn line by line. 3D CAD allows parts and assemblies to be modelled in three dimensions on the screen. Parts can be made from simple geometry such as cylinders and blocks. Or they can be made by more complex operations such as sweeps and lofts. Parts which have no regular geometric shape at all, such as computer mice, can be modelled in surfaces using B-spline curves etc.. Most of the terms used to describe 3D operations are easily understood, but there are a few worth describing to avoid confusion. A "Sweep" is the term used to describe parts which have a fixed cross-section, swept along a path. The path can be straight, curved or complex, but the cross-section remains constant. 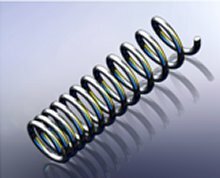 A helical path can be used to produce a spring or screw thread. Spring (variable pitch) formed using a helical sweep of a round profile. A loft is more complex than a sweep. Like the sweep, a lofted part is also a cross-section extruded along a path, but this time the cross section can vary along the way. The hammer head on the right was produced by lofting a profile along a curve path. 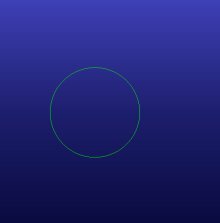 The profile goes from circular, to square and then to rectangular. 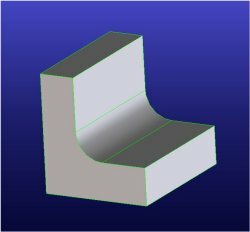 More simple geometry can be made by extruding or turning profiles. 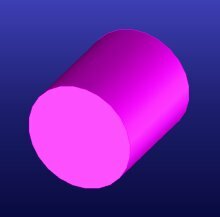 A cylinder for example can be made by drawing a circle and then "extruding" it to length. 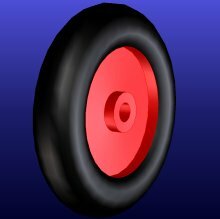 A wheel part can be made by drawing a cross-section and then "revolving" this around an axis. 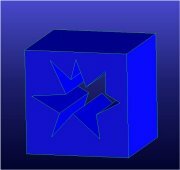 Once geometry has been created on the screen, it can be modified by punching, stamping, milling, blending, chamfering, shelling and subtracting. Parts can also be copied, mirrored, scaled and patterned. Punching and stamping are similar, but one is the inverse of the other. 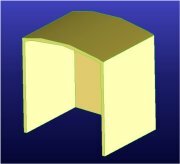 A chamfer is an angled face added to the corner of a part. 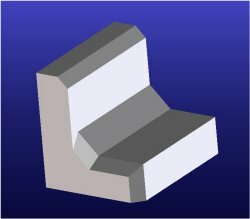 Commonly chamfers are set at 45ºon a 90º corner, but asymmetric chamfers can also be used. Rounds are corner modifications like chamfers are. 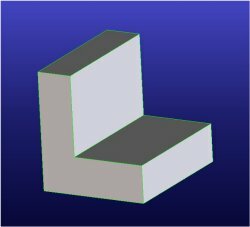 It is interesting to note that this first example which shows a rounded inner corner on a bracket; could have been created by adding a fillet to the 2D sketch before extruding the solid. Either method would give the same outcome, however by adding a 'Round' as a feature, enables it to be edited more easily later. 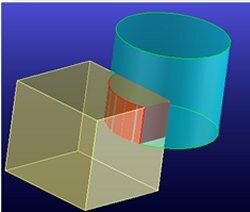 Both Rounds and Chamfers are 3D features and because of this they can be applied to more complex edges as shown in the example below. Subtraction of parts can be used within an assembly to create parts which will interlock perfectly. For example, if a bolt has been created with a thread as shown on the right. 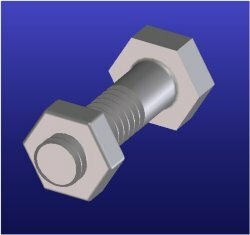 The nut blank can be positioned on the bolt thread and the bolt volume subtracted from the nut volume. 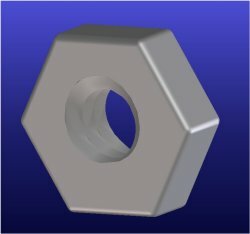 This would create a perfect matching thread in the nut and saves time modelling the nut thread separately and trying to line it up. 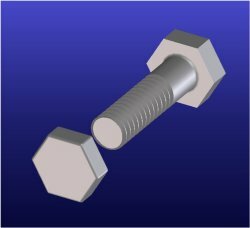 Other examples where subtracting is efficient is when making a peg to fit a hole, or cutting an axle hole in a wheel or perhaps copying the stepped profile of a shoulder screw into a counter-bore. Shelling is a powerful operation that can be used to hollow out 3D parts. 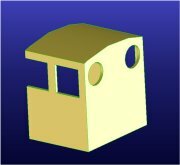 The user specifies the wall thickness of the part and any faces which are to be removed. When creating a sealed container such as a fuel tank, no faces might be removed; but in the locomotive cab model shown here, the back and bottom faces are selected. 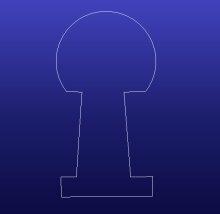 Shelling can be used to quickly represent parts made from sheet metal without going to the trouble of extruding multiple thin parts and sticking them together. 3D CAD lies at the heart of the modern design process. When assembling parts, relations can be specified to keep parts positioned as neighbouring parts are moved and these relations can also be used to animate working assemblies to check for correct running. 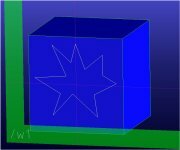 Modelling in 3D allows the user to check for part clashes. 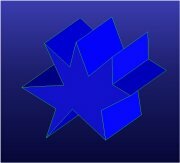 The software can detect any parts which overlap, calculate the volume of the clash and highlight it on the model. Assemblies can be animated to check for correct clearances and alignment of parts during operation. 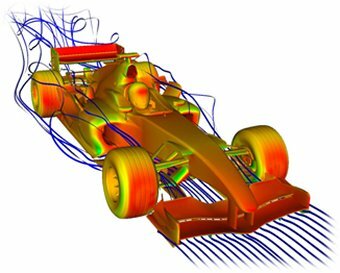 Once 3D geometry is available Finite Element Analysis (FEA) can be conducted on the part to predict its performance under certain conditions. The part also has forces and pressures applied to it. The software then calculates deflection, stress and strain on the part and shows the output graphically. Calculation is Performed by breaking the model down into a network of nodes and lines, in a process called meshing. 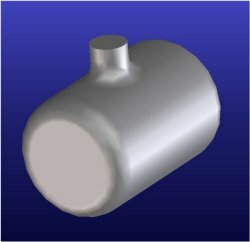 In this simple example the modelled boiler is subjected to a pressure of 100psi. The software colours the model to show where the stress or strain concentrations are under these conditions. False deformation (as shown) can also be applied to show the distribution of stress in the model. 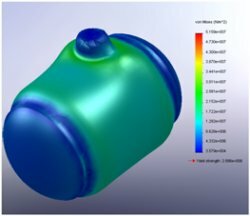 3D geometry can also be used to model airflow of a part and conduct thermal analysis. 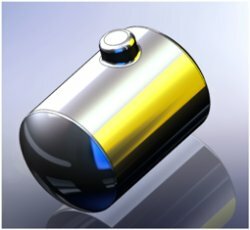 Thermal loads can be applied to components to see the affect on surrounding parts. Radiation, Convection and Conduction can all be simulated, although often one of these is dominant, so only this one need be considered in most applications. Dwell times of each particle can be calculated to highlight areas of turbulence or recirculation. 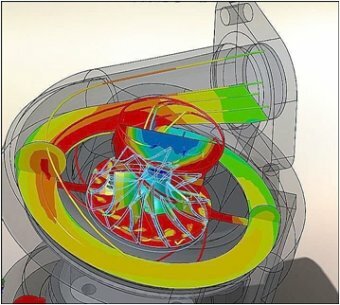 Airflow can, of course, affect component temperatures, so both Thermal and Airflow analysis are often complimentary and are calculated simultaneously by the software. 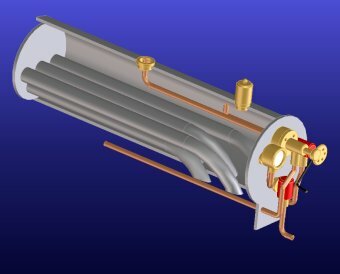 Thermal and airflow analysis involve the application of well know material properties with well establish Physics formulae. However the shear number of calculations required means that high power computers are often needed to work at the required level of detail. 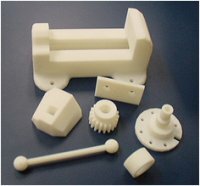 3D geometry can be made into real parts using Computer Aided Manufacture (CAM). 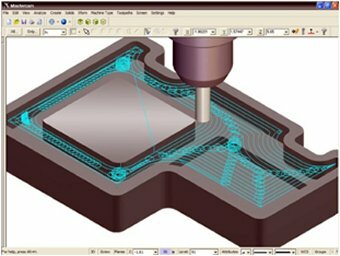 Software can be used to generate G-codes for CNC machines, including milling machines, machining centres, plasma cutters, laser cutters or any other profiling tools. Simulation programs show the tool/cutter path and highlight any clashes, and also give cycle times. 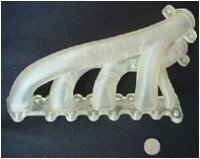 Other technology such as stereo-lithography (STL) and 3D printing, can produce rapid prototype parts in plastic for test fitting to an assembly. 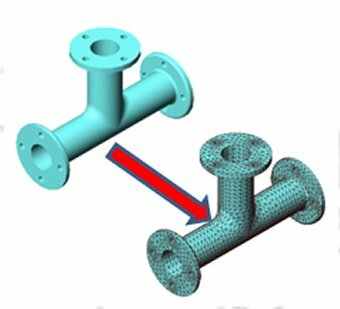 This technology breaks the 3D CAD geometry down into layers and builds up parts using UV sensitive liquid or molten plastic. 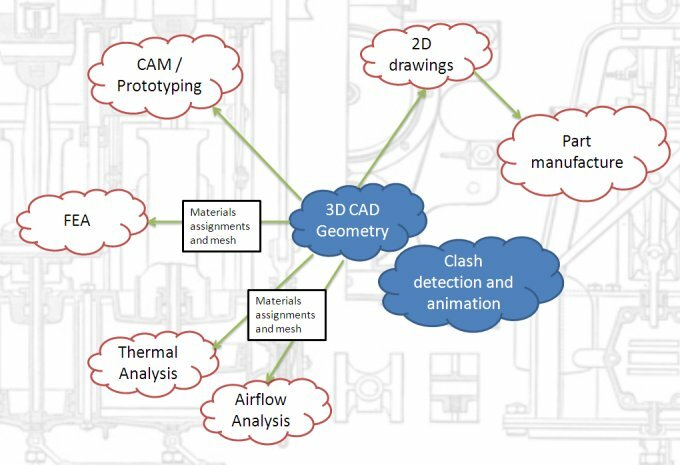 The chart below summarises the information above and shows how the 3D part of CAD is at the centre of the design process. There is a free download software from CoCreate which is a useful application to use. The only limitation of the download is that models are limited to 60 parts. This is adequate for many model engineering projects. All the 3D models on this site were produced with this software. For many model engineering parts, only basic geometry is needed. 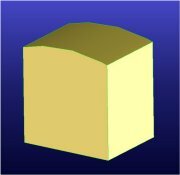 Most parts are either cylindrical or rectangular. This particular software in non-parametric. This means that parts can be created on the screen in a similar to how they would be machined in the workshop, and it keeps construction as simple as possible. 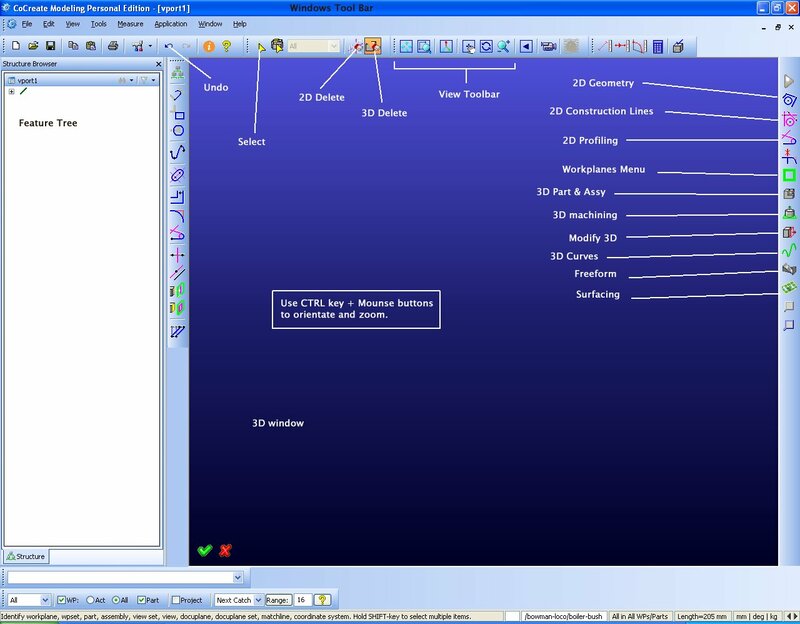 Main 3D modelling screen in CoCreate Solid Designer. (Click to view). 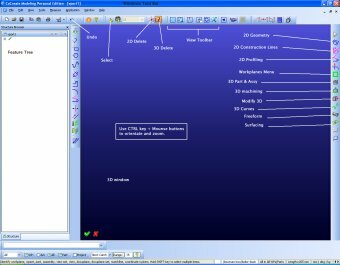 Once the 3D geometry is complete then the 'Annotation' window can be used to create 2D projections, add dimensions and any detail views required.